Last night Common and producer Twilite Tone participated in a Chicago Ideas Week event called "Keeping the Peace: Music, Art and the End of Violence," which was a discussion about the potential for art to curb gun violence. 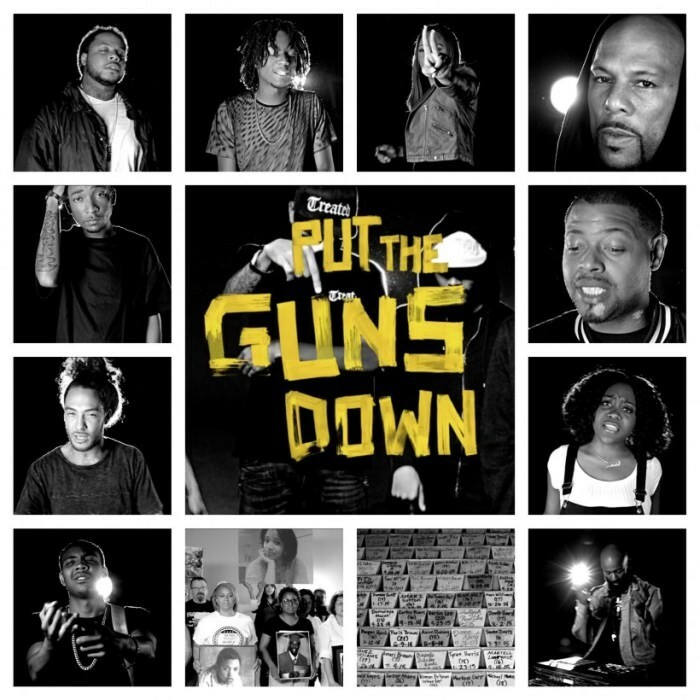 Earlier that day Twilite Tone debuted a track called "Put the Guns Down," which features Common and a bevy of fantastic local MCs, some with a sizable national following, others that deserve one, and all of whom have appeared in the Reader: Katie Got Bandz, Saba, Tree, Noname Gypsy, Lil Herb (aka G Herbo), Treated Crew's Mic Terror and Nick Jr., and King Louie, who leads things off and provides the song's hook. Executive producer John Monopoly helped rope together these disparate local voices to rap on Twilite Tone's bleak, creeping instrumental—he punctures the air with percussive stabs, a forlorn piano, and a down-pitched vocal sample repeating the word "guns." Twilite Tone made "Put the Guns Down" to help promote a project called Music Versus Gun Violence, which he's launched with Leo Burnett and Chicago Ideas—the goal is evident from the title of the accompanying song. Many of the rappers that appear on the track have a history of sharing heartfelt, affecting stories about gun violence in song. Unfortunately their incongruous contributions—some of which don't last long enough—don't live up to their previous highs. But the message is clear from the song's credits: to actually achieve an end to gun violence, people have to work together. The most moving part of "Put the Guns Down" is its video, which features a group of locals who are still tending to the wounds they've suffered from gun violence. The website for Music Versus Gun Violence features video interviews with some of the song's contributors and also the lesser-known mothers, neighbors, and Chicagoans still struggling to make sense of the shooting deaths of loved ones. If "Put the Guns Down" leads people to seek out the stories featured on the Music Versus Gun Violence site it could, in some small way, make a difference.